The slideshow of the silver tissue dress is here. The album is here. Photos are as big as Photobucket would take; I can email really huge ones on request. A later comment made more sense though. I think honestly that it boiled down to a care issue. 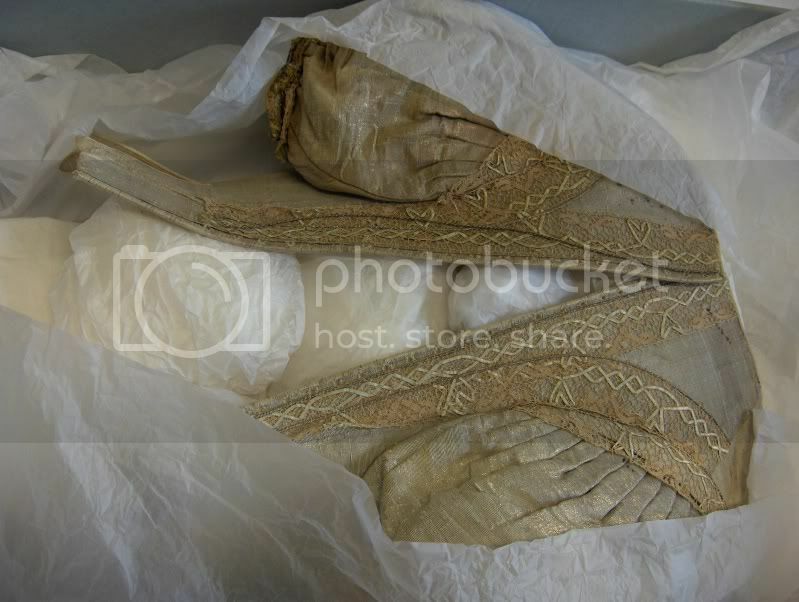 Since the re-branding of the Fashion Museum this dress has finally come off display, meaning that everyone has wanted to see it and it's been in and out of the box like a yoyo, obviously risking damage. I think they're just reluctant to keep having people handle it so much. However, I did protest that it was only the waistband I was desperate to see, as per Kendra's question about binding the pleats - enough to guilt-trip the lady at the museum into saying she could have a look into the box next time she's in the archives and see if she could put us out of our misery without having to get it out. She said she might even take some snaps. I've reminded her by email since I got back and I hope she'll keep her word. Meanwhile, in The Cut of Women's Clothes there's a drawing of a "waist belt" on the pattern, and there's no sign of such a thing on the bodice. So could that be the waistband that the skirt cartridge pleats are attached to? I have a thought about the flap on the CF of the bodice. Could it have been used for a busk? Yeah, I was wondering that. It would have to have been inserted there, from the bottom; I don't remember seeing any opening at the top and I can't see one on the photos now. Did they ever insert them from the bottom? I always assumed it was top only. Wait - I got it - Norah Waugh drew it and said "Tab to secure busk." She reckons you're right! I have tons of questions but no brain power right now - more soon! WTF on no skirt? Thank you for asking about that waist treatment! I really hope they get back to you on it. Okay, so my main question is something that I was thinking when I was working with the Norah Waugh pattern, and that is that the covering/fashion fabric doesn't match the linen/boned/tabbed layer in the front. So then what I'm assuming is happening is that: the fashion fabric is sewed down to the CF tab/piece, not to the next tab, but then to the rest of tabs working around toward the back. The dress is worn with all the tabs tucked into the skirt EXCEPT for the CF tab/piece; so the not-sewn-to-the-fashion-fabric-layer 2nd tab is tucked into the skirt while the fashion fabric layer lays on top of the skirt at that same point.